Mosa launches a brand new designer feature to bring wall and floor surface to life on the website. 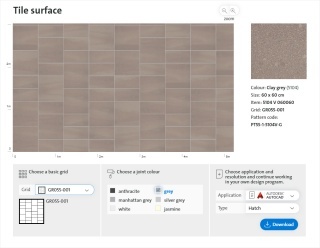 On any product page it is now possible to quickly transform the chosen tile into a tile surface with the “Surface viewer”. This feature goes beyond just viewing the selected tile as a surface: the pattern grids challenge you to design unique and complex pattern grids for sophisticated architecture. Next step after your selection is to bring the surface to your space. Simply export the surface to your designer software. Generic seamless texture files and native software files are created on the spot for: SketchUp, AutoCAD, Revit, Vectorwork and ArchiCAD. Quick and easy your building model is ready for CGI rendering and BIM. Not satisfied with the surface yet? Customize it further with Mosa Pattern Generator online design tool. It gives you all the creative freedom to mix multiple colours and size into one of a kind floor or wall surfaces. It allows you to scale and position the surface and save it in a personal My Mosa account. Additionally the Mosa Pattern Generator offers more export functions like tiler instruction (including specs and quantities) and all export files in High or Medium resolution for even more realistic renderings.